Wildlife watching is an art because it requires creativity, enthusiasm, love for all living things and a lot of patience. Wildlife watching allows you to go places you would never go to for practical reasons, but because it is awe-inspiring and brings home good memories. Successful wildlife watching is also an adventure, because it exists in the chaotic and unpredictable world of nature it often come unexpected. A rewarding adventure allows you to understand the natural world and it's inhabitants, and to learn new things that you can use in your everyday life. If you encounter a wild animal in its own natural habitat it can bring you positive memories that stays with you for a life time. That's how you know your wildlife watching adventure was successful. You didn't see any wildlife. And you didn't learn anything. Read on, in the next few minutes we’ll explore ten secrets on how to watch wild animals in Sweden. Shared by our professional wildlife guides. When you are out there always keep in mind, you are the visitor! Obviously if you want to observe a particular type of animal, you’ll have to go where that animal lives. So, you need to figure out where the population is distributed geographically. No matter how hard you try, you won’t find Moose in Kenya. If you really wanna see a Moose, try Canada or Sweden. 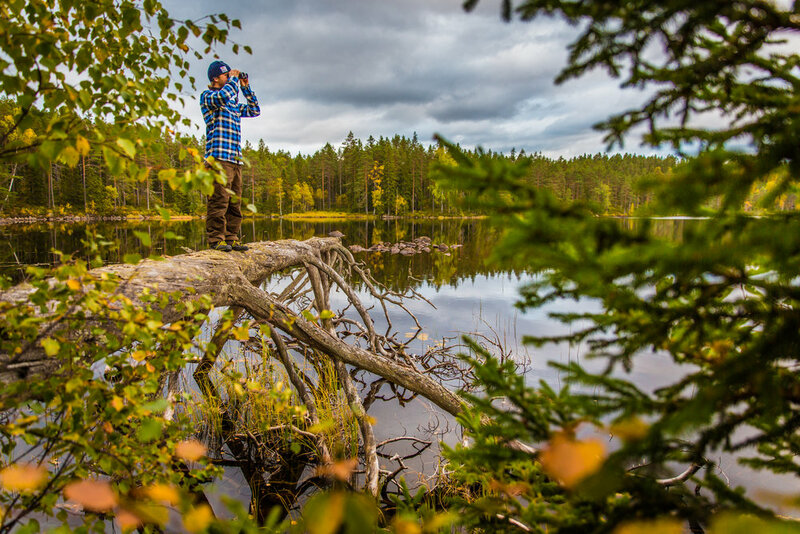 To help you out, we have composed a great guide for where to see wild animals in Sweden. When you know where to go, you should also find out what other wildlife you can expect to see in that area, and find out a little bit about them. Consider your budget and the amount of free time you have available, get your tickets, and then go out and meet nature. Most species of wildlife change their behavior throughout the year. You know Bears hibernate in winter, so you probably won't be very successful if you try to see Bears in snow. Your best chance to spot a Bear in the wild is during the early Summer right before the berries are ripe. Let's look at another example from Swedish Lapland... During Autumn Moose are often seen in the birch forests among the mountains like on these Moose expeditions in Sarek National Park. However, during the cold Winter the same Moose are often seen in the valleys, like we do on our wildlife winter tours in Lapland. Depending on which species you are interested in, you should learn more about their behaviour patterns throughout the year, and then decide when to go. Ultimately you should be in the right place during the season when you are most likely to see the animal. You also need to figure out in which habitat you are most likely to see the animal. Type of landscape and plants are important parts of wildlife habitat. Your best chances to see a Moose in Summer are in meadows and forest clearings. If you wanna see a Beaver, you need to search at a lake or a stream. To help you out here we are presenting some of Sweden's most popular wildlife species and in which type of nature you are most likely to find them. So basically, you need to be in the right region, and the right season, but also in the type of nature that they prefer. Moose rest on hot Summer days. Wolves are most active at dusk and dawn. Pay special attention to information about their daily lives and behavior - their feeding, sleeping, and breeding habits, for example — and what environments they prefer so you’ll know where and when you’re most likely to see them. Figure out the best time of day for viewing by imaging an animal's daily schedule. When does it feed? Rest? Drink? Dawn and dusk are usually good bets for most wildlife. A dry, hot, sunny afternoon is not the best time to be out. Most animals will see, hear or smell you long before you are aware of their presence. They observe you and, depending on how far away you are and how you act, they decide to stay, defend themselves or flee. Keep talking to a minimum and use hand signals whenever you can. Step lightly, not to break twigs underfoot and turn off your cell phone. 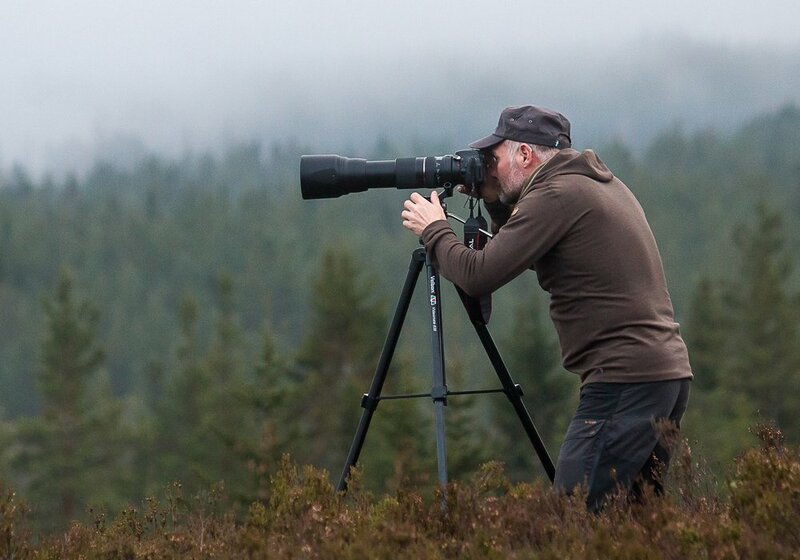 Whether you’re searching for wildlife or observing it, you’ll be more successful if you rely on more than just your eyes. Listen for cracking twigs or branches, animal calls, or the flutter of birds’ wings to help you locate animals. While you’re watching animals, listen to the sounds they make. Most species have a sense of smell that is far more developed than your human senses. For most animals smell and hearing are more sensitive than their eyesight. Therefore it can be more important not to let the animal smell you than it is not to be seen. Always move against the wind as much as possible. Don’t wear colognes, perfumes, scented lotions or hair products. Try to fade into the woodwork by wearing natural colors and avoid bright clothing if it isn't snowy. If you wear a white hat you will shine like a lamp. Clothes that don't rustle are best. Dress in silent clothes. Sometimes using a hide is a must. We always use hides when watching Brown Bears. Find a good spot and be prepared to wait. Sometimes you will see more by sitting quietly for a while and just wait for an animal to come in front of you. Waiting may sound like a boring thing to do, but waiting in nature is often both relaxing and more rewarding than you expect. The equipment you will need will vary depending on where you’re going. Make sure to bring appropriate clothing for the climate, and dress in layers. Your best bet is to ask a local what to bring. Write a packing list. Let somebody know where you will be and when you expect to be back. Research the area if you’re unfamiliar with it, and get a map and compass or GPS device if appropriate. Remember to bring a camera and binoculars. Our guides never leave home without binoculars. You see so much more. And don't forget to bring something to eat. Even the shortest excursions gets better with some snacks. 10) Local knowledge - go with a pro and see more wildlife! A guide sounds great! But is it really worth the money? Well, that all depends on your budget of course, but one thing is obvious; with an experienced local guide you can see more wildlife and at the same time learn more about the lives of the creatures you see. Of course, if you are thinking of joining a guided wildlife tour in Sweden, we would love if you come with us at WildSweden! Our guides will make sure that all of the above steps are taken care of. Our speciality knowledge is to be in the right place at the right time, to see the animals.